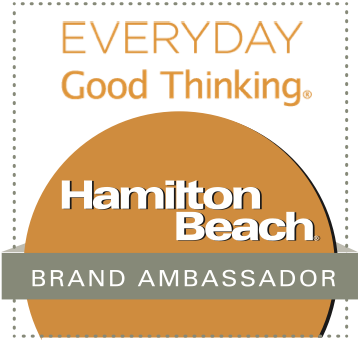 Michael and I were recently invited to come have dinner at The Esquire Tavern, located Downtown on the Riverwalk. 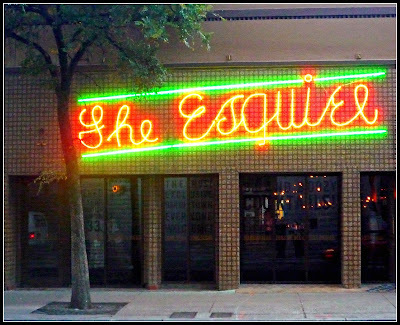 The Esquire has a very colorful history -- it opened in 1933 to celebrate the end of Prohibition, and it has been a popular San Antonio bar ever since. Following a brief closure from 2006 to 2011, The Esquire is back in a new incarnation! It offers a colorful history, and it serves up cold beer, some very creative cocktails, and excellent gastropub food with a Texas accent. Visitors can enter from East Commerce Street, or via a Riverwalk entrance in the back. We were warmly welcomed and quickly seated. We decided to start with a cocktail and appetizer while we looked over the rest of the menu. 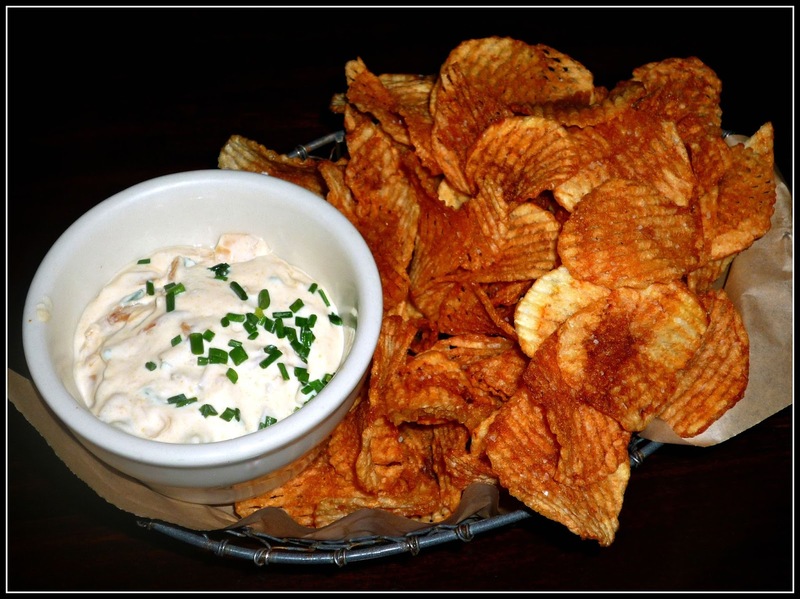 We selected the Texas Onion Dip with Waffled Potato Chips, which takes "chips and dip" to a whole new level of deliciousness! This appetizer features perfectly crisp house-made waffle chips and a creamy onion dip flavored with caramelized onions and a bit of heat. At first bite, you taste the sweetness of the onions...and then you taste a bit of heat from the addition of hot sauce on the back end. These two flavors are perfect together...we couldn't get enough of this delicious dip! We paired our appetizer with a Kill the Pain cocktail. This creative cocktail contains Jamaican rum, orange juice, pineapple juice, sparkling coconut water, and Chinese 5 spice bitters. The ingredients are shaken, then poured over ice in a tall glass. The flavors are tropical and refreshing, but not overly sweet. The Kill the Pain cocktail was a perfect match for our spicy onion dip. We quickly realized that we had eaten all of our chips. Lucky for us, it was time to turn our attentions toward our entrees. 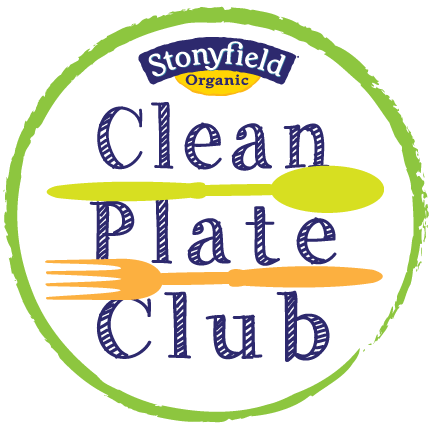 The menu features a range of creative entree salads, sandwiches and award-winning burgers, and large plates. Everything looked great, but a duo of fried options caught our attention. What can I say...we're Texans! 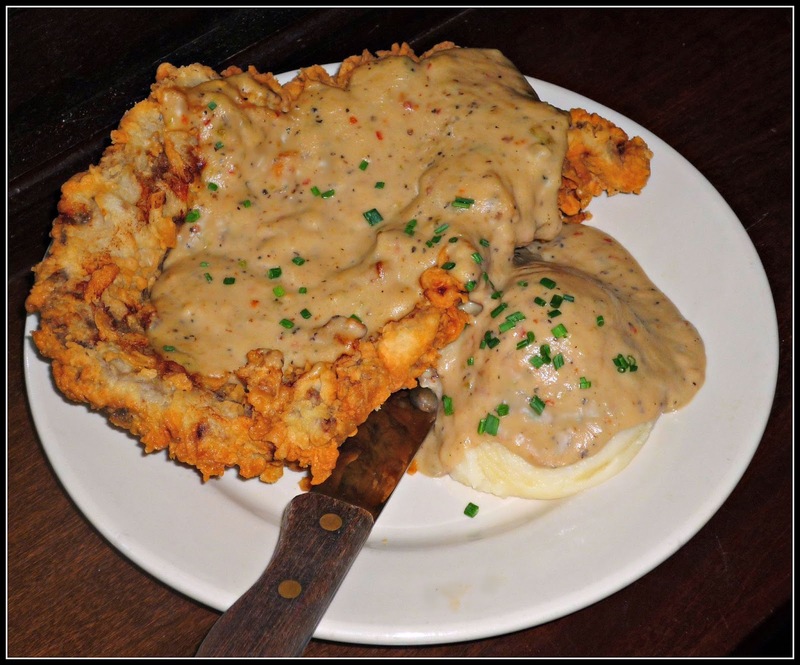 Michael opted for The Esquire's amped-up version of chicken fried steak: Chicken Fried Ribeye. This amazing dish features an 8-ounce Wagyu ribeye fried up perfectly crispy and golden outside...and tender inside. 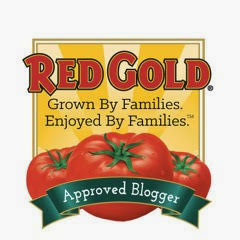 It's served with mashed potatoes and a delicious jalapeno-infused cream gravy. Unlike most chicken fried steak -- which can have tough meat -- every bite of this version is perfectly tender, with a nice ratio of steak to breading. I managed to get a couple of bites of Michael's chicken fried steak, because I was busy enjoying my delicious Fish & Chips. 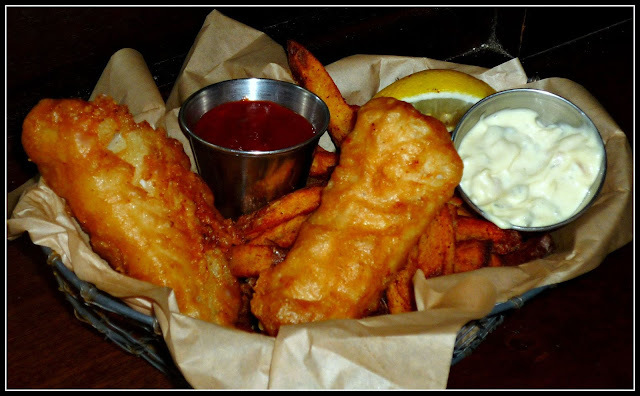 This entree is served in a basket and features two pieces of thick-cut beer-battered cod, perfectly executed French fries, and a creamy house-made tartar sauce. This is hands down the best fish and chips I've ever had! The fish is perfectly fried and not the least bit greasy, and the tartar sauce was creamy and tart. The fries are actually cooked twice, so they're crispy outside and creamy inside. I added a sprinkle of malt vinegar and was in seafood heaven! We agreed that both of our entrees were executed very well. 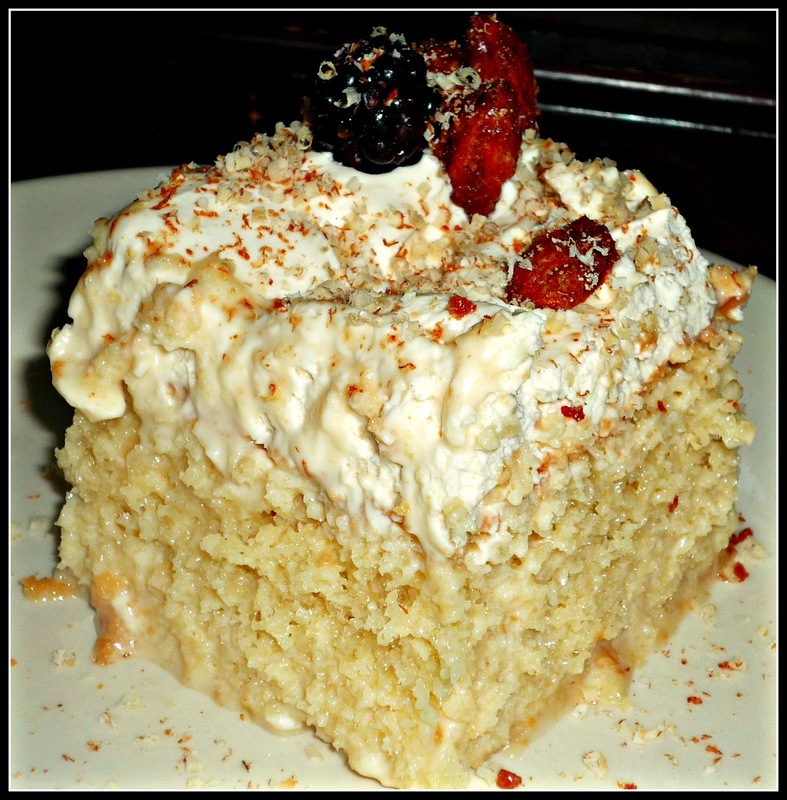 We were starting to feel full, so we decided to split a dessert -- Tres Leche Cake. If you've never had this Mexican specialty, you simply must find a way to change that ASAP! 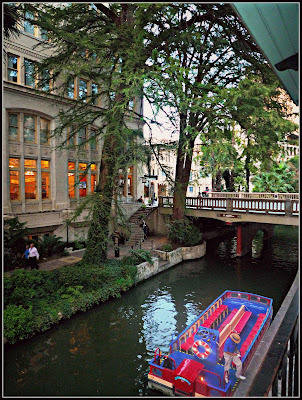 While we waited for our dessert to arrive, we stepped outside The Esquire's back entrance to snap a couple of pics of their pretty Riverwalk view -- their balcony even has a few tables outside for al fresco dining on cool days! After snapping a few pictures, we headed back inside to enjoy our Tres Leche Cake. The Esquire's version features a dense vanilla cake that's soaked in a richly sweet three-milk sauce. It came topped with sweetened whipped cream, blackberries, and candied almonds. The cake was moist, but not soggy -- the hallmark of a great tres leche cake! It was the perfect size for sharing, and it was a perfect sweet ending to our delicious meal. 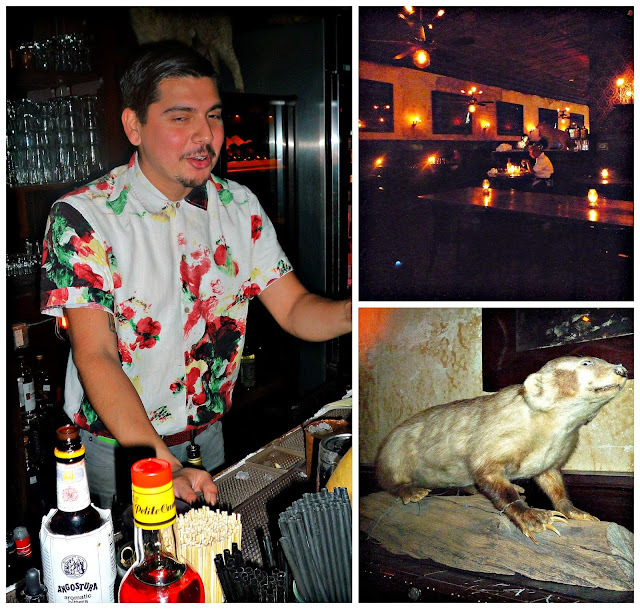 On our way back to our car, we snapped a few pictures of The Esquire Tavern's interior. In the evening, the lights are low...and the bar is hopping! They even offer some very eclectic decor -- like this stuffed badger! We left The Esquire after dinner with full stomachs, discussing how much we enjoyed the food and couldn't wait to come back to try more menu items. 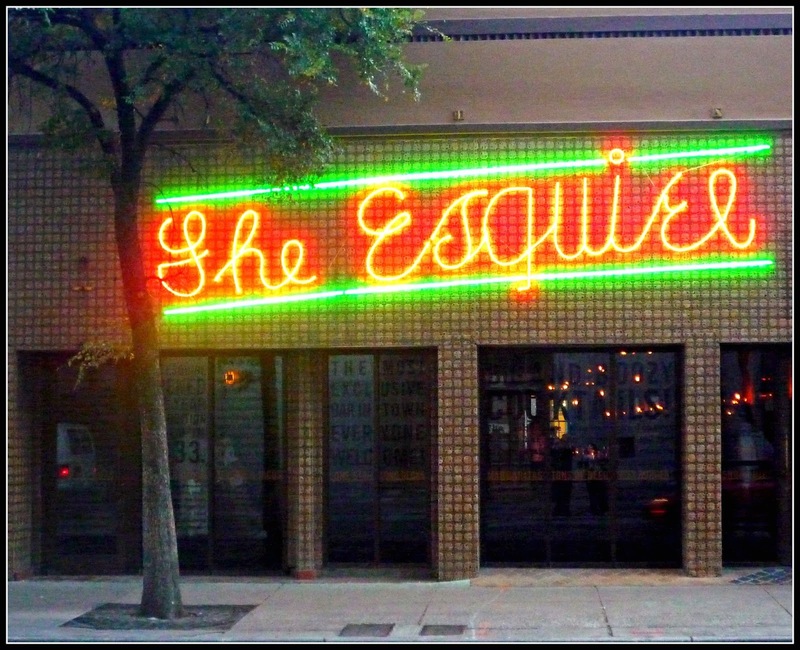 For San Antonio area readers: The Esquire does not offer valet parking, but there are several paid parking options within a very short walk of the restaurant. We parked in a hotel lot around the corner and paid $10 for 2.5 hours of parking -- it was very easy and convenient. 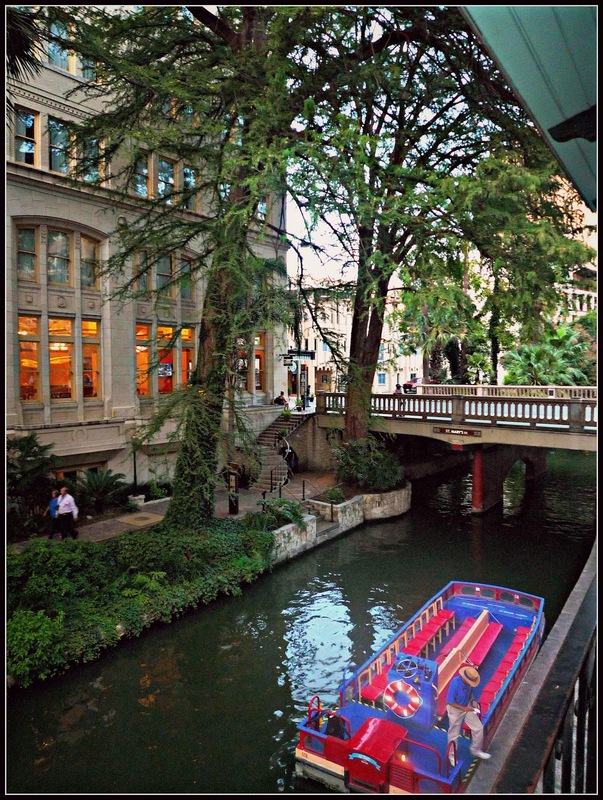 For visitors to San Antonio, The Esquire also has a convenient Riverwalk entrance. The Esquire is open for both lunch and dinner -- and they even have a late-night food menu that's served until 100 a.m. Thursday through Saturday! 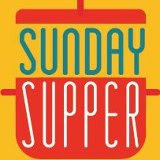 Reservations can be made online or by calling 210-222-2521. 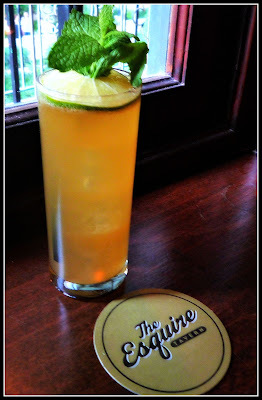 Disclosure: Our dinner at The Esquire Tavern was hosted to facilitate this article. All photographs are copyrighted by Michael K. Garcia and may not be copied or otherwise used without prior permission. All opinions stated are solely my own.